Lesley Fitton shares some exciting news around one of the latest additions to The Cycladic Gallery an extremely rare marble figurine of the ‘hunter-warrior’ type. The Cycladic Gallery (Room 11) at the British Museum now has a new addition – an extremely rare marble figurine of the ‘hunter-warrior’ type. He is the first male figurine to be added to the collection, and so is vastly outnumbered by the female figurines surrounding him, but he looks lovely and very much at home in his new surroundings. You can even see the ‘ghosts’ of his painted eyes, so the lighting is, luckily, just right. The ‘hunter-warriors’ are so called because they show an active male role. They are defined by the presence of a shoulder-strap (baldric) and a belt, and some are also shown with a dagger. This one has no dagger, but we have decided to display him next to an actual dagger of the same period. He is also near to a female figurine of the late, Chalandriani variety, so it’s possible to see how he fits towards the end of the sequence of production. He was made in the Cyclades (the Greek islands in the Aegean Sea) around 2300-2200 BC. Male Cycladic figurines are rare, but ‘hunter-warriors’ are more rare still – in fact, only three other relatively well-preserved examples are known worldwide. We had scarcely expected to be able to make such a significant acquisition, but this piece comes with a good history that adds to its fascination. It belonged to the abstract-expressionist artist Wolfgang Paalen, who lived in Paris in the 1920s and 1930s. 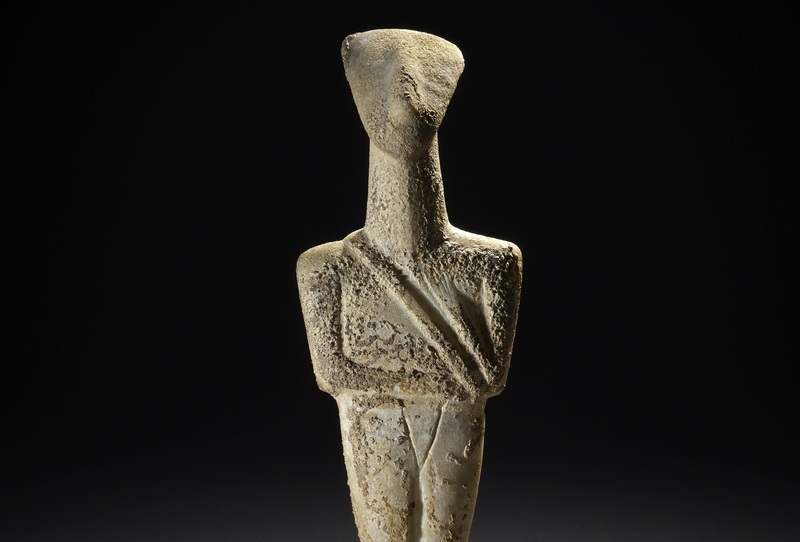 Interest in early creations such as Cycladic figurines, along with excitement about the arts of Africa, pre-Columbian South America and Polynesia, were characteristic of artistic circles in Paris at this time. In the mid-1930s Paalen produced what he called his ‘Cycladic paintings’. The influence of objects such as this figurine is very apparent in these works and we have included a small image of one of them in the display. We would hope in the future to borrow a Paalen ‘Cycladic’ painting to show alongside the wonderful new figurine, which contributes so significantly to both an ancient Cycladic and a modern Parisian story.